Established in 1972, the Haribon Foundation is today regarded as a pioneer of the environmental movement and one of the most active environmental organizations in the Philippines. In 1984, it was registered as a science and research foundation conducting floral and faunal studies and is accredited by the Department of Science and Technology. It is also accredited with the DENR and the USAID as private voluntary organization. Known as Haribon for short, the name refers to the endangered Philippine Eagle and the organization has its roots as a birdwatching society. The name has been retained despite the broadening of the mission, because the critical status of the Philippine Eagle symbolizes the environmental state of the country. In the pursuit of conservation through community-based resource management, Haribon adopts an integrated, multi- disciplinary approach that is participatory and scientifically sound. Its programs include science and research, community-based resource management, environmental defense and membership development. Haribon is a member of the World Conservation Union (IUCN) and collaborates with international organizations such as Greenpeace, the Wild Bird Society of Japan, Ocean Voice International, World Wide Fund for Nature and BirdLife International. It maintains a strong network with local environmental groups such as the Green Forum and is a member of the Board of Trustees of the NGOs for Protected Areas (NIPA). A staff of 50 professionals composed of junior scientists, community organizers, lawyers, urban planners and business professionals provide a diverse mix of disciplines within the organization to fulfill the multi- discplinary but integrated nature of conservation and development work. We envision the country's ecosystems to be conserved and managed in a socially and scientifically sound manner. We envision communities that are environmentally aware and responsible stewards of the environment. We envision a Philippine society that ensures equitable access to the benefits of its resources while promoting a quality of life that values the renewability, carrying capacity and the integrity of creation. To promote and undertake community-based resource management strategies in specific sites. To conduct scientific and socio-economic researches on the natural ecosystems for the benefit of Filipino communities and promoting sustainable approaches to development. To raise the national consciousness on sustainable development and promote a constituency for environmental issues through membership. The Mt. Isarog National Park, with an area of approx. 10,000 hectares, is noted for its rich biological diversity and high endemism, there being 150 species of birds, 33 species of mammals, and 1,163 species of plants. As a watershed, it also provides a constant supply of water for domestic, industrial and agricultural use for the city of Naga and the surrounding municipalities. Threats to the biodiversity in the park include deforestation due to logging, slash and burn farming, expansion of agricultural land, and encroachment from settlers. After five years of community organizing and education conducted in four of the twenty three barangays situated around the park, the threats from illegal logging and encroachment had been contained due to a large extent, through the vigilance and efforts of local organizations in the area. The locally formed federation, Anduyog Isarog, is actively involved in supporting local community organizations through information and education campaigns, an agroforestry project and micro- credit which seeks to provide ecologically compatible economic livelihood to local communities. The fishing community of San Salvador faces the same problems and challenges typical to similar communities in other parts of the Philippines: rampant use of destructive fishing methods, declining fish yields, and disappearing corals. The condition of the coral reef of San Salvador correlates with an assessment of the Lingayen Gulf coral reefs. Gomez and Yap (1982) indicated that out of 12 reef sample stations in the province of Zambales, two were in good condition (50-75%) living coral cover, three in fair condition (25-49.9%) and seven in poor condition (0-24.9%). Included in the last was San Salvador's coral reef status. The main accomplishment of this project is the establishment of a 127-hectare sanctuary which has significantly increased the population of marine organisms as well as the catch of the fishers in the area. The sanctuary was also seeded with Tridacna sp., a species of clams which was originally found but overharvested in the area. Using the community organizing strategy, a people's organization called the Samahang Pangkaunlaran ng San Salvador was established which, together with the local government unit, is managing the sanctuary. Another people's organization called the Cabangun Aquarium Fish Gathering Association (CAFGA) was also formed as a result of the net training activities done in the area. Other training provided to the beneficiaries were on artificial reefs and environmental education. The provision of alternative livelihood to the villagers was a major consideration, hence, linkages with the Department of Trade and Industry and the Department of Science and Technology were established. As support to the community, a multi- purpose hall was built. Bolinao, which is one of the municipalities of Pangasinan, has one of the largest fringing reef areas in Northwestern Philippines covering about 200 sq. km. of coral reef (McManus et al 1992) which makes it a vital source of genetic stock to the 24 municipalities in the Lingayen Gulf. With the alarming and continued decline of marine resources, a community-based coastal resource management program for four barangays in the municipality was conceptualized. The key components include research, community organizing and livelihood development utilizing the expertise and experience of the Marine Science Institute, Haribon, and the College of Social Work and Community Development. Training activities were conducted in zoning, ordinance formulation, enforcement and regular review of legal instruments in coastal resource management. Educational materials such as posters, slides, comics and videos were prepared and disseminated while educational activities were directed to sectoral groups such as women, LGUs, fishermen, and NGOs including exposure trips to Batangas and Zambales. Well known among divers for its soft corals and diverse marine life, Anilao in Mabini, Batangas is visited by hordes of tourists every year providing livelihoods and substantial income to the communities from tourism. However, the coral reefs of Anilao are threatened from pollution, dynamite fishing, indiscriminate mooring of boats and sedimentation from land-based development, all of which contribute to the loss of tourism value and fish productivity. After three years of community organizing and environmental education given to boatmen, resort owners, and fishermen, three (3) sanctuaries and marine reserves were established to rehabilitate and regenerate the reef resources in the area. Hardware support such as mooring buoys, patrol boats, radio sets and a training center were provided as well as seed capital for a local cooperative managed by a local organization called Samahang Pangkaunlaran ng San Teodoro(SPST). In partnership with Birdlife International, a UK-based global conservation organization working for the protection of birds and their habitat, the Haribon Foundation is implementing a research project to document the conservation status of Philippine birds and publish the Red Data Book of Philippines Birds in 1997. As indicators of biodiversity, birds provide important information on the faunal diversity of an area. The succeeding research will focus on the important bird areas in the Philippines where an inventory of endemic bird areas will provide policy-makers and planners the needed information for conservation management. The trade in seahorses for traditional Chinese medicine and the aquarium ornamental market has caused severe depletion of the seahorse stock in many areas in the Philippines. In the next five years, if the rate of depletion continues, the seahorse population is expected to collapse in the Philippines. In 1995, with support from the Darwin Initiative, the Haribon Foundation collaborated with Oxford University's Dr. Amanda Vincent to study the biology of seahorses and its conservation status. The project established a seahorse sanctuary in the Getafe municipality of Bohol where locals voluntarily allow pregnant seahorses to hatch before being harvested and sold. Livelihood opportunities such as seahorse ranching and eco-tourism together with expanding the educational and organizing activities to neighboring areas are targeted in the next phase of the project. One of the more serious threat to marine biodiversity is the use of sodium cyanide to catch food fish and tropical aquarium fishes. Sodium cyanide is used by fishermen to stun the fish for the live fish trade but destroys the corals in the process. After decades of misuse, the corals of the Philippines have been transformed into vast swathes of underwater deserts thereby reducing its productivity over the years. In 1989, with the support of IDRC of Canada, the Haribon Foundation has developed and implemented training courses for aquarium fish collectors in the use of barrier nets instead of cyanide in fish gathering. Educational materials produced include a coral reef manual (English and Tagalog versions) and a video entitled "Divers Say No to Cyanide". So far, the 800 trainee-graduates coming from four provinces in Central Luzon have federated into a national organization advocating a stop to the use of sodium cyanide in aquarium fish collection. They have initiated training activities to disseminate the net method of fish collection to other fishermen and to teach them the basic skills in safety diving and proper fish handling. Seed money for local cooperatives were disbursed in the 4 provinces. To encourage and sustain their graduates in the use of nets, the federation embarked into direct exports to obtain better prices for net-caught fishes. These forward linkages are seen to expand further and venture into eco-labelling schemes that will require the involvement and the cooperation of hobbyists, pet groups, fish dealers, NGO groups, exporters and collectors. The marine waters of the Philippines is five times more in area than the land it covers. The territorial waters of the country total 220 million hectares of which 26.6 million hectares is considered coastal, 18.5 million hectares is shelf area and the rest is oceanic. Coastal resources/area/zone management is therefore an important function for the country's sustainable development. Up until now, the management of this area is still fragmented and no one government agency has jurisdiction over coastal management. It has in fact become more complicated today because of the enactment of the Local Government Code. To leapfrog the conservation of our coastal areas, it is important to create a critical mass of individuals all over the country who have similar framework for action and the necessary skills to pursue coastal management. And in order to do this, developing a broad-based curriculum for coastal management is imperative. An Organizing Committee headed by Haribon with the Coastal Environment Program of the DENR, Philippine Council for Marine and Aquatic Resources Development (PCAMRD) of the Department of Science and Technology (DOST), Bureau of Fisheries and Aquatic Resources (BFAR) of the Department of Agriculture (DA), International Institute of Rural Reconstruction (IIRR), and the International Center for Living Aquatic Resources Management (ICLARM) is implementing this project, the long-term objective of which is to develop a constituent of local cadres for coastal zone/area/resources management in the Philippines from local government, DENR, academe, NGOs and POs both at the national and local levels. The short-term objectives are the following: a) to bring together Filipino practitioners in CRM/CZM/CAM to share lessons and develop a common framework for action; b) to develop a curriculum/module for CRM/CZM/CAM training; c) to conduct 3 pre-test training for Luzon, Visayas, and Mindanao; d) to conduct 12 regional training and train at least 240-300 Filipinos; and e) to begin regional networking for CRM/CZM/CAM. The project is divided into two phases. The first phase involves an analysis of the training needs and the various local CRM initiatives, program designing and curriculum development and pre-test of training program for Luzon, Visayas, and Mindanao. The second phase includes local regional training, post-training documentation, implementation and evaluation, and Southeast Asia regional networking. The Haribon Foundation has developed and piloted a 12-day training module on protected area management for NGOs implementing biodiversity conservation projects in their respective sites. Supported by the Foundation for Philippine Environment, the training course aims to impart to participants the basic principles and concepts in protected area management and the basic techniques in management plan preparation, implementation and evaluation. The course adopts the case method of instruction where theories and actual experiences of the participants are combined to create an analytical and empirical basis for discussion. A big component of Tanggol-Kalikasan is paralegal training. As of 1994, a total of 34 paralegal training were given to almost 1,000 people nationwide. A tangible result of these training is the organization of environmental paralegal teams composed of those who underwent training. A total of 10 paralegal teams have been formed in Regions 3, 4, and 5. Lectures, numbering 48, on environmental laws mostly delivered in state public schools upon the initiation of the deans and other officials were also given. Direct assistance to communities was also provided through resource management sessions. As part of its information and education activity, a total of 18 factsheets which are one-page statements on topics which are worthy of the public's attention and concrete positive governmental action have been written and disseminated. Publications such as the Environmental Law Handbook, Local Government Code Primer, Citizen's Primer on Air Pollution, and a Training Manual on Environmental Law for POs, NGOs, and LGUs have been published. Technical assistance to NGOs is also provided. Tanggol-Kalikasan has also joined several investigation and/or apprehension operations conducted under the joint efforts of EIIB, local PNP and DENR. It is also currently handling litigation of several cases, all of which concern violations of environmental laws. The ENDEFENSE Fund is a fund set up to finance litigation on behalf of the environment and in defense of environmental activists and enforcers. It is administered by Tanggol-Kalikasan, Haribon's legal program and governed by an Endefense Council composed of alternative lawyers from Luzon and Visayas. Apart from litigation, the fund also supports other legal empowerment mechanisms such as training and publication. Recognizing the lack of technical capacity among lawyers engaged in environmental litigation, Tanggol- Kalikasan invited Dr. Mark Chernaik, a lawyer-biochemist from the U.S. Office of the Environmental Law Alliance Worldwide. Strategies for technical evidence gathering and community-based monitoring of technical parameters were explored in a series of workshops attended by NGOs and lawyers' groups. As a result of this project, a database of Philippine technical experts and a primer for community monitoring of major environmental parameters were drafted. The Philippines has long been dependent on fossil fuel to power its needs. Since fossil fuel is non-renewable, alternatives should be considered. Thus, baseline studies on renewable energy options such as solar, thermal, photovoltaic system (PVS) were prepared. Included in the study is a critique of the Philippine Energy Plan (1996- 2005) but efforts were focused on reviewing and facilitating the Department of Energy project called Pro-Solar in a community in Polillo Island, Quezon. Initial review and assessment of existing solar projects in Batangas, Bulacan, and Zambales were also conducted. Specific recommendations to further promote renewable energy in the country is the highlight of the project report which will be published in December 1995. 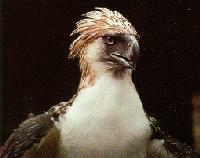 The Philippine Eagle is celebrating its centennial this year when it was first discovered by Whitehead in 1896 in Samar. To support our Philippine bird conservation program, we are selling our remaining copies of the eagle print - a 3' x 4' framable print of the majestic Philippine eagle - which can be displayed in the lobbies of offices or homes. There are only 500 copies of this limited edition, and around 15 are remaining. The prints are sold for P30,000 each. Contributions are tax-deductible in the Philippines. Interested buyers may contact Mayrose or send inquiries thru email.